Yeah... seen an article regarding Septa's plan for the new trolley cars. I want the Kawasaki cars to stay in service. I really like them and will miss them if the new trolleys replace them. I grew up loving the K-cars and miss the cars when they used to be painted like this: https://cdn.vox-cdn.com/thumbor/fjmPkDq ... x0:441x287)/cdn.vox-cdn.com/uploads/chorus_image/image/47990495/Screen_20Shot_202014-09-15_20at_202.06.23_20AM-thumb.0.png and with the rollsigns. Will the new cars replace the Kawasaki cars? I hope not! Better yet i hope the new cars don't come out for many years into the future. I'm sorry to burst your bubble but this isn't going to happen. The K-cars are old and prone to breakdowns, too small, and most importantly not ADA compliant. They would need a full rebuild similar to the PCCs on the 15 and that doesn't solve issue #2. Last edited by silverliner266 on Tue Feb 27, 2018 5:38 pm, edited 1 time in total. silverliner266 wrote: I'm sorry to burst your bubble but this isn't going to happen. The K-cars are old and prone to break down, too small, and most importantly not ADA compliant. They would need a full rebuild similar to the PCCs on the 15 and that doesn't solve issue #2. Well put. The K's date back to 1980-82 which will make them ~40 years old when the new artics arrive. Even if SEPTA did want to keep some running they'd face problems finding replacement parts. They already went down that path with the non-rebuilt PCCs and Red Arrow cars, where some parts had to be custom-fabricated and others cannibalized because there were no off-the-shelf suppliers. Heck, I loved the P&W Bullets and suburban 70-series cars too and was sad to see them go, but they were effectively rolling museum pieces* . There was no practical way to keep them in revenue service. The PCC on the Route 15, can go. Never rode that one before. Don't care to ever. I mean, i might, just for the experience just to see what the interior is like but besides, isn't that a PCC next to the 13th Street Station on the MFL? Below the Septa customer service office? Anyway, the Kawasaki cars have been the product of my Septa fandom since my early childhood. To be fair, I understand their old age and Septa wanting to replace them for that reason. I was sad enough to see the rollsigns replaced by digital signs. When i first heard long ago about the new trolley proposal, at first i thought "well why not build NEW Kawasaki cars with same exterior design but with new features, like monitor display screens (like inside the Silverliner 5s), softer seating, and maybe wheelchair-accessibility? but then again, according to the new article, this change affects the 10, 11, 13, 15, 34, and 36 trolley routes... and i'm understanding this to mean the double-faced Kawasaki cars will remain in service? Am I understanding that right? The thing about it is, I always liked how the double-faced and single-faced K-cars had similar designs but with some major differences. I've always been a fan of that! For one thing, i love the new buses they got in service. I just wish they're were more of them so that's one thing. 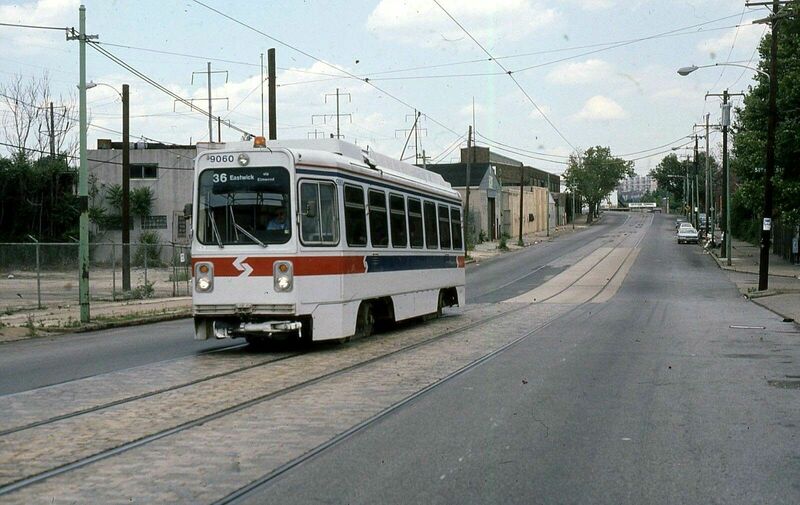 Hopefully these new trolleys Septa is proposing will be anything like the trolleys on the Norristown High Speed Line. I freaking LOVE the Norristown High Speed Line! Speaking of the display at Septa customer service, if the K-cars really are going, i hope Septa will at the very least put one of their old K-cars on display down there, a double-face and a single-face each... WITH the rollsigns on the driver's seats and the side windows, with this paintjob, and we're allowed to just sit and chill on the trolley at the passenger or driver seats (without the functional controls of course lol). I will have felt like i've gotten a piece of my childhood back because that'd be so nostalgic. SEPTA - Southeastern Pennsylvania Transportation Authority. It's not a museum service. If you want to go to a museum, check out Steamtown and Electric City Trolley Museum in Scranton. They don't keep things around because they're "cool". Heck, look at the new locomotives! They're ugly, and they are just getting on the property! scotty269 wrote: SEPTA - Southeastern Pennsylvania Transportation Authority. It's not a museum service. Okay, go back and reread what i wrote. Where in my post did i say anything about wanting to visit a museum and that Septa was one? What I was saying was that since they have that green trolley on display near 15th Station Station I hope they also have the K-cars on display also since they're going out of service, if they go out of service. BTW - Septa also isn't a gift shop, yet there is one right around the customer service office. I'm sure a few will be preserved somewhere. I'm not sure the basement level of 1234 Market has enough room for 2 new trolleys, I might be wrong but I think they have a GM Fishbowl bus down there too. The K-cars on the Red Arrow routes will be replaced as well but there is no timeline for that yet. The biggest problem with the K-cars in that wheel chair accessibility isn't an option, it's required by law. The easiest way to do that is with a low floor design. What we will end up with is somethin like the Flexity Outlook they are currently buying in Toronto. JeffK wrote: Heck, I loved the P&W Bullets and suburban 70-series cars too and was sad to see them go, but they were effectively rolling museum pieces* . Some years ago, a visiting official from another property asked the mechanical officer (at the time) in charge of the K's whether he was also responsible for the Bullets, then still in service, I think along with the ex-CTA cars and others. He replied "we have a curator for that." ExCon90 wrote: Some years ago, a visiting official from another property asked the mechanical officer (at the time) in charge of the K's whether he was also responsible for the Bullets, then still in service, I think along with the ex-CTA cars and others. He replied "we have a curator for that." IIRC the surviving Brill stock (Bullets and Strafford cars) were OOS by the time the CTAs arrived. They were retired in early '90 and the line was temporarily bustituted until the CTAs were available that Fall. During the bustitution period there was brief talk about converting the line to a private busway à la the late, lamented Ardmore trolley. Reportedly that idea - thankfully - evaporated when UMTA intervened to tell SEPTA that conversion would be treated as abandonment, which would require SEPTA to repay much of the funding they'd gotten during the prior decade. Did the last Bullets reach 59 years, into 1990 and possibly briefly '91? The biggest issues with the 1981 Kawasaki cars is their split folding door (non-ADA). This also forced the CTA 2200s into retirement (and by the late 1990s were operated in mixed trains to allow an ADA car in each train). When the Kawasaki cars were ordered in 1979, was a single leaf folding door considered? It was used on the Boeing cars and CLRVs and mini-high ramps and bridge plates could have done the trick, as with SF MUNI and MBTA. I hope we're not getting something that ugly. It's bad enough that the new fleet will be low-floors. And with the S.S. K-cars, the blinker doors in the center could be replaced with bi-folding doors, the center partition removed, and a lift can be installed. The suburban K-Cars OTOH, does present a problem. Why do say low floor is bad? It speeds loading and unloading of all passengers and makes ADA compliance a lot easier. The biggest argument against rehabbing the K-cars was identified in the modernization report, the K-cars are too small. The current system is operating at capacity during peak hours, you can't add significantly more trolleys to the tunnel. I was on a trolley this morning and we were sardine standing room by the time we got to the portal. We have an opportunity to make sure that the system is designed to be relevant in the future and failing to seize that opportunity for the sake of nostalgia would be a huge mistake. R36 Combine Coach wrote: Did the last Bullets reach 59 years, into 1990 and possibly briefly '91? I can't find specific dates for the Bullets' withdrawal but a number of historical cites give 1990 as the last year for revenue service. I hope we're not getting something that ugly. JeffK wrote: IIRC the surviving Brill stock (Bullets and Strafford cars) were OOS by the time the CTAs arrived. They were retired in early '90 and the line was temporarily bustituted until the CTAs were available that Fall. The twin-car CTA El sets arrived in 1986. That was an interesting (read: very weird) time on the P&W, and the shape of things to come until 1993. The official farewell charter excursion was run that summer. By October 1990 only one of the two die-hard Bullets remaining (number not available) was still operational, but at that point I recall that either one or both cars were already withdrawn from revenue service. I do not recall exactly when those final two Bullets were removed from the property for scrapping.